Spirits producer Biggar & Leith has launched the “first luxury” Italian gin expression in the US, called Malfy Gin. Created at the family run distillery in Moncalieri, Italy, by the Vergnano family, the gin is infused with Italian juniper and five other botanicals including Italian coastal lemons to deliver a “fresh and zesty” aroma and palate. The bottle design features a sea-blue label to represent the Mediterranean and the stopper is made out of Italian oak. “We were researching the history of gin – and there it was, staring us in the face; gin was invented in Italy, long before the British of Dutch,” commented Elwyn Gladstone, founder of Biggar & Leith. “However, it wasn’t until we tasted the Vergnano family’s Malfy GQDi that we knew we had found a gin that represented the literal distillation of Italian quality, culture and craftsmanship. 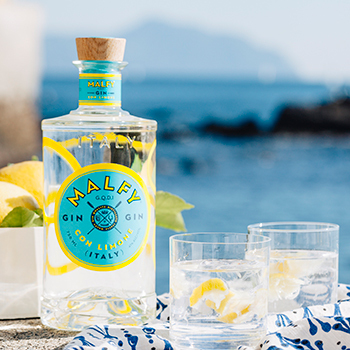 Bottled at 41% abv, Malfy Gin has an RRP of US$30 per 750ml, and will be launched throughout Europe, Australia and other international markets in due course.